Description of all known species in hamsters. How to care about your hamster. Food, water, cleaning, taming, handling etc. 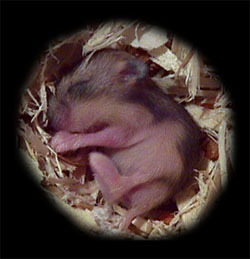 How to breed hamsters - or better: What to know about breeding hamsters. Informations about cages, accessories, houses, wheels....etc. Informations about known dangerous cages, toys, beddings, wheels etc. Stories and pictures about furry little hamster-families. Hamsters are real personalities - for some of them you´ll find special pages in this section, stories and pictures are provided by other hamster-lovers.